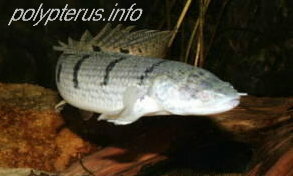 There is little information about Polypterus in most fish and aquarium books, and even on the web there are few English-language sites with comprehensive information about Polypterus. The basic concept behind this website is to bring together information about Polypterus, and to provide both an enjoyable website for those keeping Polypterus, and an accurate information resource for those with a deeper interest in this fascinating group of fishes. I decided to create polypterus.info due to my strong personal interest in the Polypterus fishes. My original website, The Tropical Tank, is a general hobbyist website and I felt that I wanted to create a separate website to concentrate on one of my main interests (obsessions? ), within the fishkeeping hobby. You can see current details of my own collection of Polypterids here.